Disclosure: The boro glass toggles were kindly provided free-of-charge by Artbeads.com, within the frames of Artbeads.com blogging program. The author of this blog has not received any payment from above-mentioned company. The post above represents only personal opinion of the blog author. Disclosure: The Tania Hartman Resin and sterling pendant as well as the boro glass toggle were kindly provided free-of-charge by Artbeads.com, within the frames of Artbeads.com blogging program. The author of this blog has not received any payment from above-mentioned company. The post above represents only personal opinion of the blog author. I am continuing to work on the seahorse necklace featuring a seahorse resin on sterling pendant by Tania Hartman provided to me by Art beads (www.Artbeads.com). 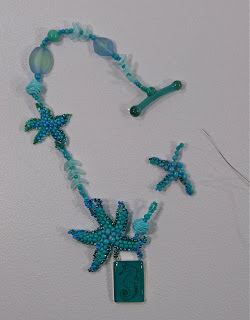 I have pictured a beadwork starfish in progress. 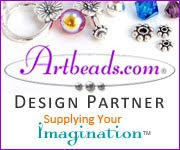 I first establish a ring of five beads and then construct a bead ladder out from each bead one at a time, brick stitching back to the center along one side of the ladder to move on to the next arm. The starfish arms are tapered by varying the size of the beads used. I also like to incorporate "hinges" in my necklaces. This gives a pivot point that does not stress the thread. Here I have connected separate modules (the starfish) with loop in loop hinges. For more information on this method, look up the back issue of Beadwork magazine: Beadwork. "Stress Redux: Send in the Reinforcements!" by Joanne Strehle Bast, Summer 1998 issue. Disclosure: The Tania Hartman Resin and sterling pendant and boro glass toggle were kindly provided free-of-charge by Artbeads.com, within the frames of Artbeads.com blogging program. The author of this blog has not received any payment from above-mentioned company. The post above represents only personal opinion of the blog author. Disclosure: The Tania Hartman Resin and sterling pendant was kindly provided free-of-charge by Artbeads.com, within the frames of Artbeads.com blogging program. The author of this blog has not received any payment from above-mentioned company. The post above represents only personal opinion of the blog author. The "Sleight of Hand" deck of cards exhibit closes in Pittsburgh this Saturday May 8. I am going to Pittsburgh for the Saturday afternoon artist's talk and will bring my piece "Clubbing the Night Away" 6 of clubs home when the exhibit closes at 5PM. I am excited to see all the pieces together and to hear others talk about their work. The exhibit is at the Borrelli-Edwards Gallery listed below. The deck of cards will continue to be on sale at least through he extent of Fiberart International.